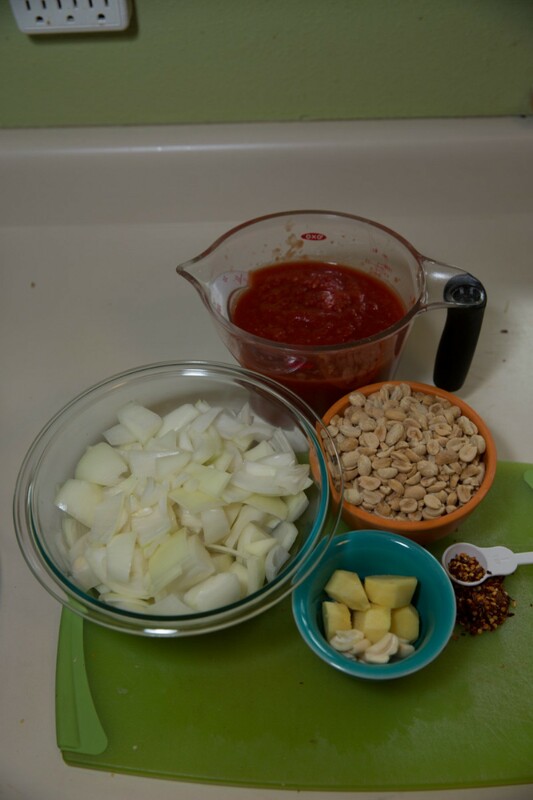 This recipe combines ginger, garlic, tomatoes and peanuts for a rich and hearty soup. Add ground turkey and chicken broth to make this vegetarian recipe appealing to the carnivores in your life. This is based on a recipe published by the Colophon Cafe in Bellingham, WA. I loved this soup when I was in college and have used their soup cookbook to recreate it for years. This vegetarian soup is spicy and filling but you could use chicken broth and add ground or chopped turkey to make it even heartier. * Fresh tomatoes would be great if they are in season. I used a large Costco can of crushed tomatoes and measured out about 4 cups for the two cans of crushed tomatoes. 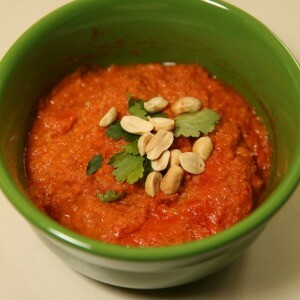 Using a blender or food processor, combine crushed tomatoes, peanuts, onion, garlic, ginger and crushed chili peppers. 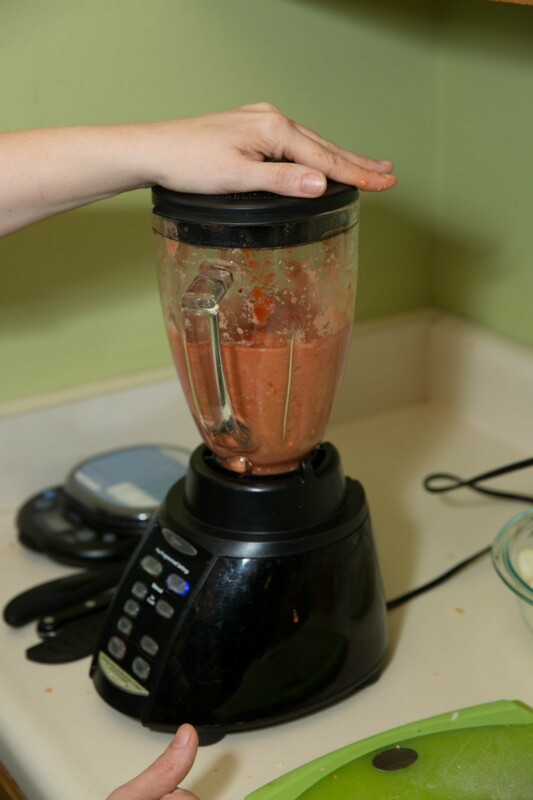 If using a blender, add liquid tomatoes first and work in batches to make sure everything is finely chopped. Add finely chopped or blended ingredients to a stockpot. Add broth and about 3 cups of water and heat to just a boil. Reduce heat and simmer on low for at least 30 minutes up to 3-4 hours. Be careful not to let it burn by stirring often and keep covered to avoid splattering. A slow cooker could also be used for this recipe. 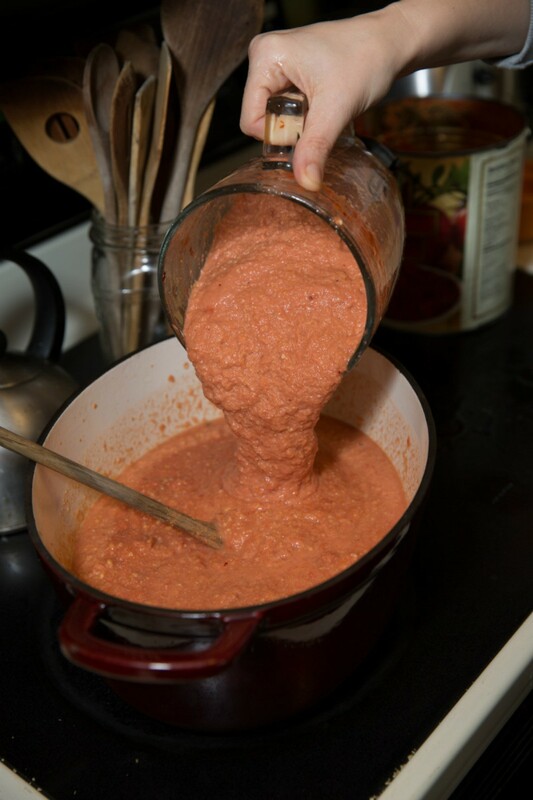 A short time before serving, add diced tomatoes and more broth/water for desired consistency. Garnish with more peanuts and herbs, if you wish. 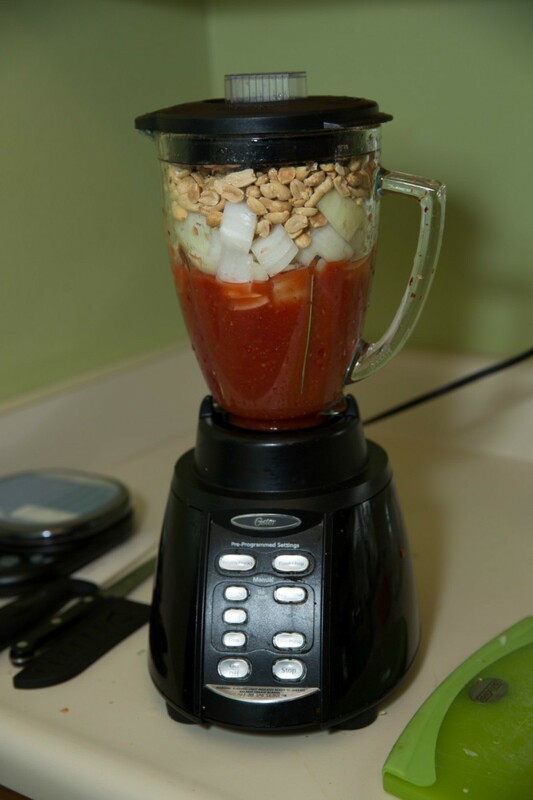 After making this, I'm thinking of ways to reduce the amount of peanuts (expensive and high calorie) by adding in some garbanzo beans. It seems like the texture would be unnoticeable and it would make it a more nutritionally rounded soup. I'll report back if I have any success with this variation. Good thinking (garbanzo in lieu of at least some of the peanuts)! If you can find them dried, soak them overnight then cook for a few minutes to bring them to exactly the consistency of peanuts.